Welcome to the opening “splash page” of Captain Miracle: In the Beginning! 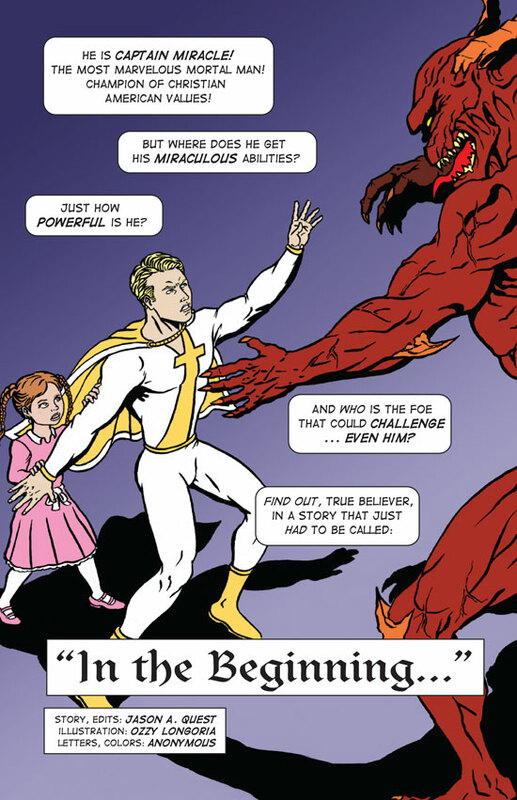 This is the second story to be published in its entirety for free online, by Holy Comics! (The first was Fetus Christ, exploring a world in which the Virgin Mary did the unthinkable: she aborted the Messiah!) New pages will be posted every week, at sundown on Fridays (marking the beginning of the Sabbath, as outlined in God’s Covenent with the family of Israel), from now until 11/11/11. And remember to click those “Christian Ads” so you, too, can guarantee that these comic strips become a cartoon and then a star-studded motion picture!